Merope, a beautiful but faded star nymph, is banished to Earth for displeasing the gods. She tries to fit in, go to school and live a normal “human” life. And then she meets Lukas. But relationships between goddesses and men are forbidden. Will their love grow? Or will Merope and Lukas feel the wrath of the gods? I swooned before I opened the first page. 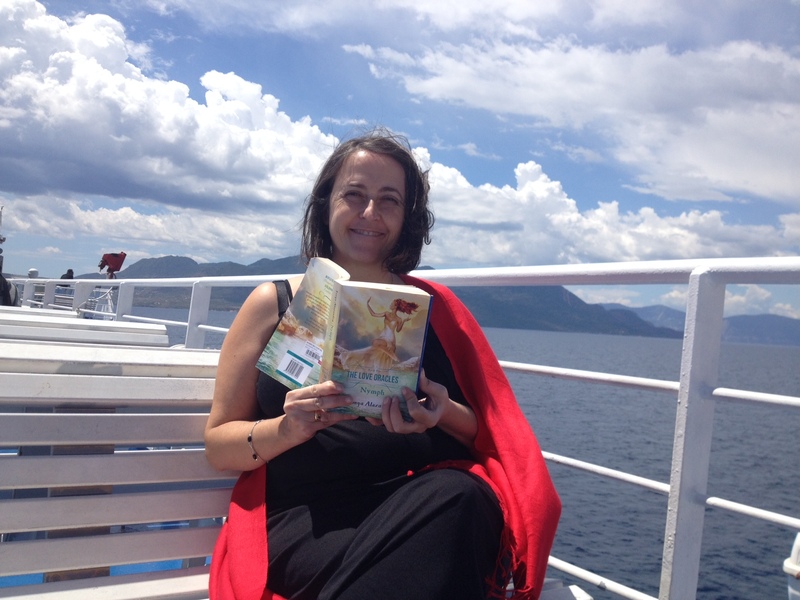 However, I was patient and did not start reading Nymph until I was on a ferry leaving Piraeus heading for Poros, a small island in the Argosaronic gulf near the Peloponnese. 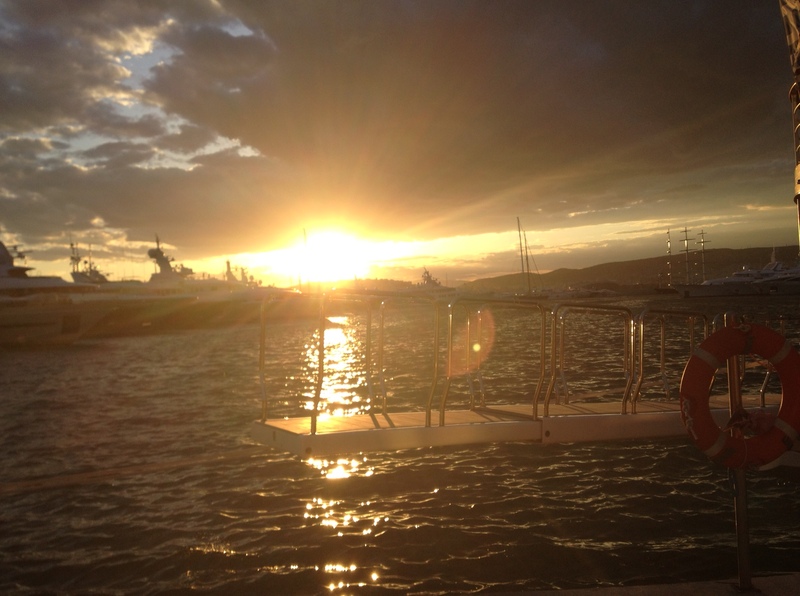 The ferry ride to Poros is magical. I sit on the upper deck, the wind is gentle, the sea is calm and the ferry passes by container ships and yachts as it starts its journey first to Aegina, then the volcanic peninsula of Methana before arriving in Poros, an island separated from the mainland only by a 200 metre wide strait. Along the whole way, the sea meets the mountains, the diffuse light filters through the clouds as I am quickly immersed in the story of Merope and Lukas. Merope, daughter of Pleione and Atlas, is a star nymph – making her immortal as she will live as long as her star shines in the sky. Merope has been stalked by Orion for many centuries. Orion is handsome but creepy, depicted as your slimy, leather clad lothario. Merope turned down Orion when he asks her to be his consort and Zeus exiles her from Olympus. She is sent to live on a Greek island as a teenager with her uncle Prometheus as her chaperone. Merope is a celestial creature but she has always felt that she is not as good as her brighter nymph sisters. She has an incredible beauty, so much so that she needs to transform herself to be more ugly, more faulted, like a mortal, for her time on earth. She’d never read such heart wrenching material. The mortal couple loved each other physically and emotionally. It was so much more powerful than the relationships she witnessed on Olympus. As Merope comes to understand the ways of mortals, she is also warned by Zeus and creepy Orion to keep away from humans. Even her mother, whom she has not seen for centuries, appears to her from the sea and warns her off the earth boy, saying that he was off limits to her. This happens during a peculiar scene in which Lukas had become blind drunk (a touch of Australian culture rather than Greek, I think) during an 18th birthday celebration and vomits much to her bafflement. But this does not dissuade her from Lukas and several scenes later they finally kiss sending Zeus into a fit of anger. This was like a Zorba the Greek moment for me. This intense moment where I felt that every harried, rushed moment where I try to fill my day with as much as I can possibly manage is justified. This intense need to live life to its fullest for we are not celestial creatures. I loved this book. I loved Tonya Alexander’s depiction of modern Greece, of Greek teenagers that closely reflected the behaviour and attitudes of the Greeks I know. I was wary at first, as she is an Australian author, that Australian and Anglo mores would be more evident. I was pleasantly surprised. I loved the way gods and events are weaved into the psyche of this book. It was just the way Greeks, without realising they are doing it, weave Greek mythology into their everyday conversations with stories of love and narcissism, over-indulgence and cunning commonly told in parallel with real events. This book had everything I love in it. There is a wonderful sense of Greece through the description of light, the sea and the land. There is youthfulness and fun and kefi. There is an AWESOME AWESOME dance scene where I felt the pulsing and pumping of the crowd. And there was even a vomit scene. This book is about the relationships that Lukas and Merope contend with the way they stand their ground against people that want them to be malleable and agreeable to the detriment of themselves. Love and happiness are thwarted whenever there are a multitude Olympian gods involved and Lukas and Merope have much to contend with throughout this story. But most importantly of all this book is about love and romance and finding the right person for yourself. It is a heart clenching, pulse racing romance. I adored it. I highly recommend it. And I now anticipate the next books in the series. I highly recommend it, Miss B. I’d love to know what you think of it, particularly as to whether they depicted modern Greeks well or am I so accustomed to Australianisms that I didn’t notice them as much. Well, rats, I went to order it and it’s not yet available in Canada. I’ll keep trying, though. I too am interested in the depiction of contemporary Greeks … and it also sounds fun and delightful. Try Oz booksellers Booktopia, Fishpond or The Nile. I’m so glad you liked my book, especially since you have Greek heritage, I wanted it to be authentic. And reading it in Greece – wow! I am very jealous. I went to Greece about ten years ago and am desperate to get back there.